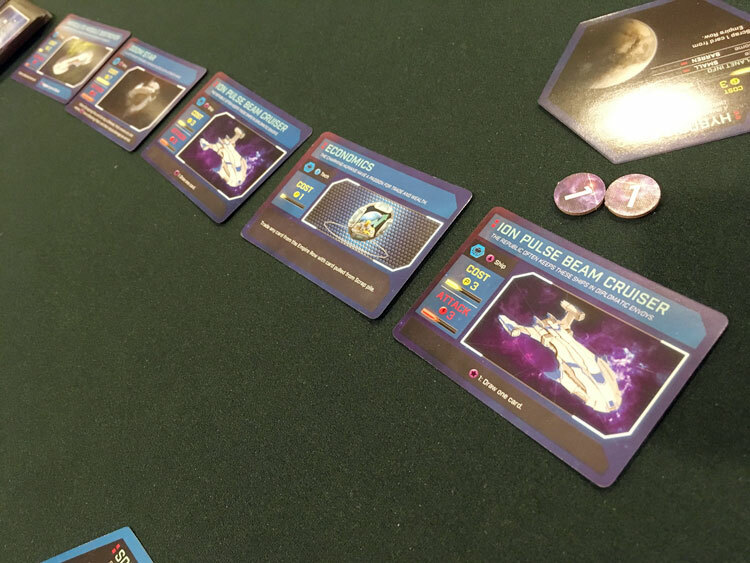 We review Master of Orion: Conquest, a new deck building game published by Cryptozoic Games. Master of Orion: Conquest is a 2 player only game that pits the Darklock Faction against the Human Faction in a war for survival. 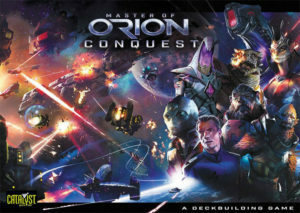 Master of Orion: Conquest is a two-player card game that simulates the planet for planet battles that occur in the PC game of the same name. Each player takes a starter deck and builds in cards from their own card row. The ultimate aim is to destroy the opponent’s homeworld in about 30 minutes to an hour. Essentially, Master of Orion: Conquest is a deck building game in similar veins as Star Realms and Core Worlds. However, the duel here is between the Darlok and Human races, both notable in the PC game. The empire card row for the Human player features ships and technologies mostly similar to the Darlok. The starting decks feature combat ships, a colony ship, scout ships, and some space factory ships. The final ships here act as “production” (aka money) cards. 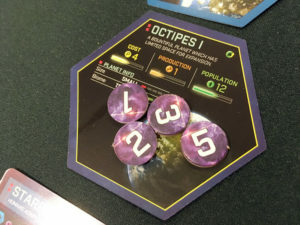 Production points are used to acquire new planets which add to a player’s overall “life” points as represented by the total population score of all planets. 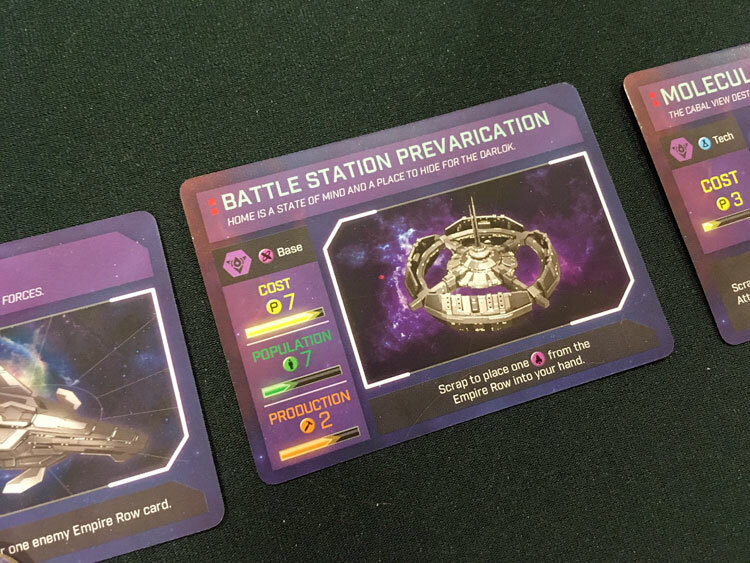 Production is also used to acquire ships from the player’s personal card row. What’s more, any production spent is tracked with tokens so money spent one round is banked for the next. In addition, even though this is a deck building game with some common tropes, players need not play all their cards. Hand management comes into play allowing players to strategically choose just the right time for a card play. When players attack by playing combat ships, each ship is grouped into a fleet which is assigned a target. Attacks on planets reduce the population which is again tracked with the multi-use tokens. When a player’s home planet is destroyed, they lose the game. Base cards purchased will help defend a planet by adding to its population. As much as this style of game has found a place in the hearts of many gamers, the implementation here borders on frustratingly unplayable and under-developed. While there are some good ideas here, the whole package smacks of something rushed. Planet-cards add to a player’s production and act as “life points” by way of population. First, the card quality and print quality could use some rethinking. The planets are hexagonal cards which make them awkward to shuffle. There’s really no purpose to the hexagon shape. The same effect could be achieved with square cards for which sleeves can be found. In addition, the card quality is flimsy and the colors are often not consistent from card to card. Second, there’s really not much going on in the game. There are some combos to be made and certainly, the style of play of waiting for a perfect hand is somewhat interesting. However, the sides and strategies are so narrowly focused that there’s not much engagement in choosing what to build into a deck. 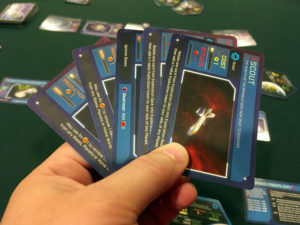 There are very few technologies in each player’s stock of cards to play, so modifying a strategy is based on whether a player can get to those cards. Players cannot hold cards in the normal way because the crucial information is obscured. Third, the rulebook needs some visuals and a lot of rewriting. The concise structure of the text and sentence choices invite lots of confusion about how to play and what cards have what effects and when. Players new to deck building games should avoid this title and seek a game with a better introduction to deck building. Fourth and final, hundreds of years of usability testing have proved that a portrait orientation for playing cards is what works best for human hands and referential decision-making. Only in a Bizarro universe would a graphic designer choose to change this, yet, all of the cards that are played with have a landscape orientation. This is a ridiculous, needless design decision and makes the game aggravating to play. Gamers interested in frustrating game design and who are desperately in love with Master of Orion and card games like Star Realms can give this a shot. Card design and quality issues make Master of Orion: Conquest an instantly regrettable purchase, and gameplay is passable at best. Only those who have exhausted all other gaming avenues in those categories will likely find something of value here. 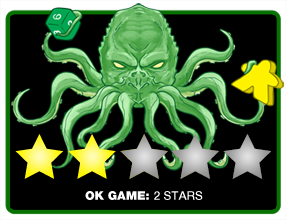 Final Score: 2 Stars – Barely escaping an awful rating, the gameplay saves this title just enough from card quality, design, and rulebook issues. So, basically same level of awfulness as the PC game WG made. What’s funny is I actually like the new PC game from WG. It’s definitely not the pinnacle of gaming and could never live up to the MOO reputation, but it’s not “bad”. Same with the Master of Orion board game just released. This, however, was not a great experience. Thank you for the review. I loved the franchise myself, but I cannot understand these instructions. I wish they explained the discard pile better. I am purchasing ships to discard them does not make sense to me.